If you shut your eyes and imagined beauty and reopened them to see the Hula Valley in the far north of Israel’s Upper Galilee region, you’d be forgiven for thinking you were still dreaming. The Hula Valley is a magical place, of history, of nature, and of miracles. The Hula Valley is the best place to do bird spotting in Israel, and one of the best in the world due to its location on a major migration route for birds travelling from Europe to Africa and Asia. The Hula Valley Nature Reserve and the valley as a whole offers bird spotting, endless hikes and walks, bike trails, and beautiful nature to absorb. At the beginning of the 1990’s one of the areas of the valley became flooded again as the result of heavy rains. It was decided to develop the surrounding area and to leave the flooded area as it was. The new site, named Agmon HaHula, became the second home for thousands of migrating birds that pass through the area in the autumn and spring, as well as the home of many native birds, making it a popular sight for bird-watchers from Israel and abroad. Tens of thousands of birds of over 200 species, including cranes, storks, pelicans, cormorants and egrets, stay in the reserve, knowing they can find an abundance of food here and in the Hula Valley in general. The reserve also shelters rare aquatic plants, such as yellow flag, paper reed and white water-lily. Water buffalos graze in certain areas to preserve the open meadow environment. Species that have become extinct in the wild, such as the white-tailed eagle, have also been reintroduced here. Agmon HaHula has walking paths, observation points, and telescopes for observing the thousands of birds that inhabit the site. Visitors can also go on guided tours that offer explanations about the birds that inhabit the Valley. The Hula Valley forms part of the northern Great Rift Valley also known as the African Rift Valley which stretches as far south as Mozambique in Africa. Bird watchers come from around the world to take in the birds the valley offers among great facilities including walking paths, observation points, and telescopes. 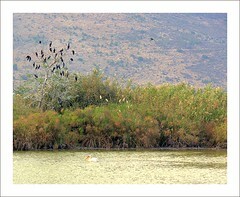 Visitors can also go on guided tours that offer explanations about the birds that inhabit the Hula Valley. 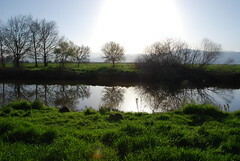 The Hula Valley is one of the most water-abundant places in Israel and features beautiful springs including Ein Tina, the Jakhula, and the large rivers such as the Dan, Snir, Hermon and, of course, the River Jordan. Because of the abundance of water the area is green and flowering, and contains numerous nature reserves such as HaTanur, Tel Dan, and the Banias, famous for its waterfall. 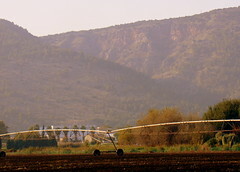 The Hula Valley also boasts archeological sites such as Tel Hatzor, tourist attractions such as the Tel Hai Photography Museum, historical sites such as the Tel Hai Compound, and entertainment centers for children and families such as the Manara Cliffsand cable car. 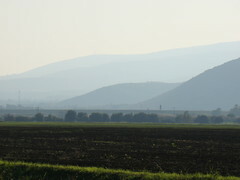 The Hula Valley is one of the most beautiful regions of Israel which is a beautiful country. Enjoy the slower pace of life and natural and man-made beauty this place offers in abundance.